Debugging tools should just work. Any target. Any electrical interface. Any CPU. Any number of cores. Debugging tools should help you get the job done faster by supporting download rates faster than 10 MB/second, high-speed I/O, and automatic detection of any configuration—including complex multicore systems. You can rely on the Green Hills Probe for all of this. 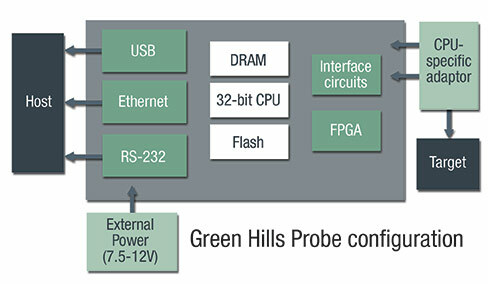 The Green Hills Probe is an advanced hardware debug device that connects to the onboard debug ports present on most modern microprocessors, such as IEEE 1149.1 JTAG and BDM. With support for more than one thousand devices from over thirty manufacturers, a flexible electrical interface, and out-of-the-box support for the largest multicore systems, the Green Hills Probe provides fast, reliable debugging, programming, and system visibility to projects present and future. Flexible design is ready for any CPU and multicore configuration. High-speed design enhances productivity in every phase of your project. Extends the power of the best IDE available to every CPU. The Green Hills Probe supports more than one thousand devices from over thirty manufacturers with a flexible electrical interface and out-of-the-box support for the largest multicore systems providing fast, reliable debugging, programming and system visibility to projects present and future. With its reflashable firmware, the Green Hills Probe is easily and constantly upgraded for new CPUs and new debugging requirements arriving on the market. Reuse the Green Hills Probe for your next project and save on startup and setup costs. Green Hills Probe’s easily replaceable Target Transition Modules and flexible electrical interface connect to any target conceivable. Supporting a wide voltage and clock range, the Green Hills Probe can fully exploit debug interfaces of all speeds and capabilities. The performance and feature set of the Green Hills Probe are designed to enhance developer productivity and minimize schedule risk during all phases of a project. Smart, automatic configuration for a quick start, full on-chip register visibility for fast bring-up, and ultra-high-speed memory access for fast downloads, memory viewing, and programming all help you get going faster on any project. The Green Hills Probe’s advanced target control architecture and wide target support eliminate downtime waiting for download of large code images and tediously accessing device registers. Extensive field upgradeability and high-performance, proven design ensures that hardware units purchased now will provide the same productivity benefits for future projects. 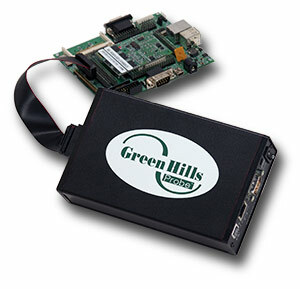 The Green Hills Probe offers maximum flexibility by supporting three host interfaces, multicore debugging, ultra-high download speeds, and an on-board 32-bit CPU that can be reconfigured for different targets. Tightly integrated with the best embedded development environment in the world, the Green Hills Probe is an integral part of the MULTI IDE that has helped developers ship great products on-time for over 15 years. The MULTI development environment supports more target processors, operating systems, and third-party tools than any other IDE—making it ideal for enterprise- wide deployment. By using a common set of development tools across projects, software engineers can more easily share code or move between projects without compromising productivity. With MULTI, you can develop code in C, and C++ (and Ada with Green Hills Software’s AdaMULTI IDE). MULTI supports all major 32- and 64-bit processor architectures—as well as the leading embedded and general purpose operating systems and development hosts. The MULTI IDE’s tight integration with a broad array of third-party tools provides you with maximum flexibility and choice. You can optimize your own development environment— invoking your favorite tools, editor, or configuration management system all from within the MULTI environment. MULTI can even be used with your existing Eclipse environment.